& now I have them, too. a navy print dress, on purpose. bearded, lustful to the point of sullen. I am beautiful in my harmlessness! he says. You’re the only one who cares. many people are tender from the right angle. I’m hungry & confused. Save me. I love a good barbecue. 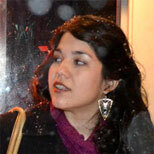 Analicia Sotelo earned her MFA in poetry from the University of Houston. Her poems have recently appeared in The Antioch Review, The Indiana Review, West Branch, Subtropics, iO, and elsewhere. In 2014, she was a Junior Fellow at the Ithaca Text/Art Symposium, a collaboration at the intersection of photography and writing. She lives in Houston.